One of the routine work that is looked as too complicated by most of the bike riders are the problem of replacing their bike chain. But just a span of 20 minutes is enough to accomplish the work. Bike chains are not manufactured for permanent usage, they should be replaced periodically. Usually, the users will not be ready to change the chain in an appropriate manner, as there is a usual thought that it is of quite unknown task to the common people. Actually the replacement consists of two steps. The initial step is to remove the old chain with the help of the locally available bike tools. The correct current position of the old chain should be noted in order to place the new chain properly in its appropriate position as the old chain. To employ the chain removing tool, its slotted jaws should be properly aligned with the chain. When both fit-in in a proper manner, the handle of the tool should be rotated with an eye towards the heading out of the pin. But it should be taken care that the pin should not emerge out fully or else it’s difficult to place it in correct position. The new chain can be made to fit in correct position with the help of the old chain and the unnecessary chains should be cut off by using the chain tool. For making proper number of chain links, the links should be counted downwards on the new chain. The links should be lifted continuously till both the old and new chains align in the right manner. Now the pin should be locked in the correct position with the help of the chain tool for perfect fitting. The final step is to bring the new chain into action. It is usually desired to start the task of putting the chain from front to back of the bike laid on its side. 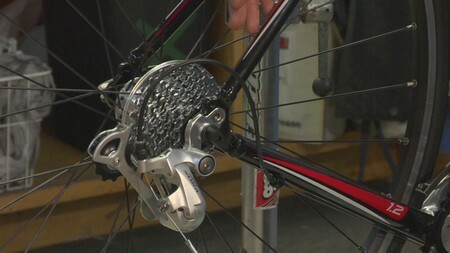 When it is put in the front end of the bike, it is pulled to back cog by using chain tool. In order to reduce the rigidness in the chain, it should move back and forth. The kinks present in the chain should be removed by peddling. After that, the new chain should be lubricated for smooth handling by oiling at all the points, and then the excessive oil should be removed. The replacement of chain varies from one bike to another kind of bike, but only by a little amount. It is advised that each rider should bear their own tool kit to ensure their own demand of changing the chain. It is also advised to do it with the help of another person in order to avoid the time consumption.